Our Social Issues Committee responds to critical community issues. 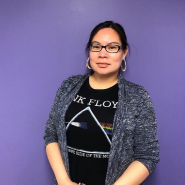 My name is Veronica, I am a mother of three, I am Dënesųłiné and I am from the Lutsel K’e Dene First Nations, which is located in the east arm of the Great Slave Lake in the Northwest Territories. I am in my second year of the Mount Royal University Social Work program, and am currently completing my social work practicum at the Women’s Centre. The month of March is National Social Work Month, a month dedicated to acknowledging the social work profession. Social work is more than just a career of helping people – it is also one that has many challenges and rewards. I see social work as a gift aimed at helping people navigate through life’s challenges and rewards. As an Indigenous social work student, my wish is to live in a society where we have less children in care and more programs dedicated to empowering families. The history and relationship between Indigenous people and Canada has not been a positive one – the statistics demonstrate this truth. For example, Indigenous children account for 7% of all children in Canada, but make up almost one half (48%) of all children in foster care. The reality is that families are being separated and children are being taken away from their families, community and culture. As an Indigenous social work student, learning about the statistics of Indigenous people within institutional systems, I have come to realize the importance of advocating for more Indigenous social workers within these institutional systems. Why did I choose to become a social worker? I recognized the need for more Indigenous social workers and I believe in empowering all people. I chose this profession because I am a person who believes in the equality of all people. I also believe in creating safe spaces for women to advocate for themselves. Advocating for people is something that takes courage in speaking truth; we encourage people to advocate and have a voice. I chose this field because there is a need for Indigenous social workers to speak up and advocate for Indigenous people – especially the children in the child welfare system. Social workers have an obligation to provide resources, support and opportunities for the benefit of all people. Social workers advocate for equal treatment and protection under the law and challenge injustices, especially injustices that affect the vulnerable and disadvantage. Social workers uphold the right of people to have access to resources to meet basic human needs. Social workers promote social development and environmental management in the interests of all people. As a social work practicum student, I have had the pleasure of observing the work of the women at the Women’s Centre. You can see it in the faces of the women who come into the Centre, you can hear it in the laughter of the women, and also see it in the relationships of them women who come into the Centre. The work being carried out coincides with the Canadian Association of Social Workers (CASW) Code of Ethics Values listed above. The Women’s Centre’s mission statement, “To be every woman’s place for support, connections and community.” Is a reflection of the resources, services, and opportunities of the women being supported within a safe space. This National Social Work month, I invite the Women’s Centre community to take the time to learn more about the significance of social workers in our society, especially Indigenous social workers! Meet Veronica, our new Practicum Student! Meet Emma, our new Practicum Student! Meet Shola, our new Basic Needs Coordinator! Meet Diane, our new Fund Development Coordinator! Meet Nicole, our Fall Practicum Student! Meet Sindy, our Fall Practicum Student! Introducing Mita, our Summer Artist in Residence! Meet Grace, our new Girls Leadership Coordinator! Supporting Our Community - Through Football! Meet Suabayreen, Our Summer Practicum Student! Meet Melissa, Our Girl Programs Summer Assistant! Summer Camp Programs for Girls are Back! Meet Girls Rock Camp, our Winter Artists in Residence! Girl Connect Camps - Calling ALL girls in grades 5-12! Meet Jessica, Our New Practicum Student! Meet Hannah, Our New Practicum Student! Meet Cobra Collins, our Fall Artist in Residence! Thank You Women's Centre Volunteers for Your Support in Building Community! Meet Jessica, Our New Part-Time Communications Assistant! Meet Julia, Our New Practicum Student! Meet Breanna, Our New Practicum Student! Any woman. Any age. Any story. Meet Taylor, our Communications Summer Student! Social Issues Discussion: What's the Deal with Child Care? Meet Sabrina, our New Practicum Student! Meet Khirman, our New Practicum Student! Meet our First Artists in Residence, Femme Wave! New Childminding Program at the Women's Centre! Meet Krystal, our new Community Development Coordinator! Girl Power Camps are back! Meet Alexe, our new Practicum Student! Meet Karen, our new Communications Coordinator! Meet Amanda, Our New Learning Coordinator! Girl Power - Spring Break Camp & More! Vote for Girl Power Camp! $400 in 3 Challenge - Win a VIA Rail Pass! Katie joins the WC team! Football season is on the horizon! Saying Hello to New Students! Toy Room 2014 - A New Record! Are Our Political Leaders Up for Debate? Thanks for a great celebration! Yoo-hoo, football season is here again!! Our 2013 Annual Report is now available online! Thank you for sharing a very special day with us! Thank you for making our new home possible! Come celebrate the opening of our new space! Yes, we finally did it! Join our walk and share your thoughts! Win free airfare, rail travel, a trip to the spa and more! Win a WestJet return trip for two! IWD 2014: Inspiration, community and amazing food! Yes, we are still moving! Will you run or walk for women? Toy Room 2013 - We did it! Still looking for that perfect gift idea? Pride Calgary: Come celebrate with us! Lifelong Learning needs your vote! Make One Change is almost here! It's time to get out the old soapbox! Girl Power Summer Camps - registration now open! Who will be at Make One Change? We're moving and we need your help! Running with you, just not beside you! All our kids are worth it! Scotiabank Marathon: Let's go Team Women's Centre! Speak. Share. Thrive. Phase Two. Help Us Make the Women's Centre a Better Place! There is no 'I' in Food! Women's Centre Football Volunteers Rule!! Run or walk for women! Join us for Jane’s Walk 2012! Honour a woman in your life! International Women's Day 2012: A Woman's Work is Never Done! Will you run and walk for women? WC Book Club: Read more in 2012! Global TV: The Women's Centre need toys!!! Give a child a gift! Will you fill out our online survey? Women, Unite! Take back the Night! Stampede Lunch 2011 - Yahoo!